The Fullerton Union Pacific Railroad Depot was originally constructed at 109 W. Truslow Avenue on the opposite side of Harbor Boulevard from its current location. The Union Pacific Railroad was the third to lay tracks through Fullerton and to build a depot, which firmly established the city as the regional rail center for northern Orange County. In addition to being prototypical of the depots for the Union Pacific Railroad from the early 1920s, the structure represents one of the six important examples of the Mission Revival style in Fullerton. The structure was composed of two sections - one for passengers and another for freight operations. By far the more decorative, the passenger section consisted of an eight-sided domed drum topped by an unusual round cupola. A Mission style parapet occurs at the two ends of the main gabled roof. An arched arcade with a Mission tile shed roof is situated on both sides of the main entry. The stepped parapet at the main entry is a deviation from the typical Union Pacific Depot design, offering an unusual combination of Zigzag Moderne and Mission Revival styles. The freight house section was a much simpler design with its flat-pitched gable roof supported by exposed wood trusses. A wooden loading platform once skirted both sides of this section of the building. To avoid its demolition, the Redevelopment Agency successfully moved the building to its present site in 1980, and it was subsequently rehabilitated and converted for use as a sit down restaurant. Some additional construction was needed in this conversion, but all of the character-defining features of the structure's original architecture were retained. Along with the Pacific Electric and Santa Fe rail lines, the Union Pacific Railroad played a major role in the development of the city. The tremendous growth in population and agriculture in north Orange County in the early 1900s attracted the Union Pacific Railroad to place a line through Orange County as part of the connection between Los Angeles and Salt Lake City. Its first attempt failed, primarily because of resistance from the Santa Fe Railroad; after World War I, the power and influence of the Santa Fe Railroad had diminished, and the Union Pacific Railroad finally obtained the right to establish its tract. 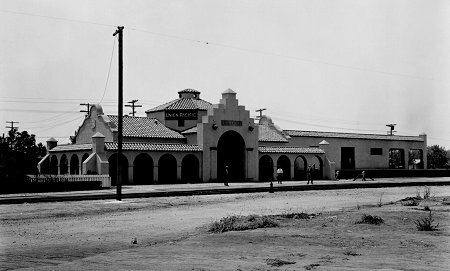 The depot in Fullerton was built in 1923, and a competition with the Santa Fe Railroad commenced. In 1930, the Santa Fe Railroad demolished its old wood-framed structure and built its impressive Spanish Colonial Revival depot. The depots of the three rail lines remained active until the late 1970s. The relocation and preservation of the Union Pacific Depot in 1980, brought all three historic depot buildings together as part of a planned transportation center, which has become a regional hub for a urban transit system.